This article is about the prehistoric culture. For the freeway in Phoenix, Arizona, see Arizona State Route 143. For the Oakland Athletics' spring training facility, see Hohokam Stadium. The Hohokam (/hoʊhoʊˈkɑːm/) were an ancient Native American culture centered in the present US state of Arizona. The Hohokam are one of the four major cultures of the American Southwest and northern Mexico in Southwestern archaeology. Considered part of the Oasisamerica tradition, the Hohokam established significant trading centers such as at Snaketown, and are considered to be the builders of the original canal system around the Phoenix metropolitan area, which the Mormon pioneers rebuilt when they settled the Lehi area of Mesa near Red Mountain. Variant spellings in current, official usage include Hobokam, Huhugam, and Huhukam. 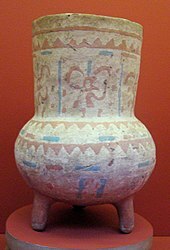 The Hohokam culture was differentiated from others in the region in the 1930s by archaeologist Harold S. Gladwin, who applied the existing O'odham term for the culture, huhu-kam, meaning "all used up" or "those who are gone", to classify the remains he was excavating in the Lower Gila Valley. According to the National Park Service Website, Hohokam is an O'odham word used by archaeologists to identify a group of people who lived in the Sonoran Desert. Gila and lower Salt River drainages[clarification needed] in what is known as the Phoenix basin. 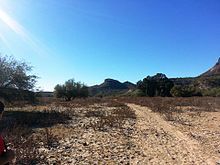 This is referred to as the Hohokam Core Area, as opposed to the Hohokam Peripheries; or adjacent regions into which the Hohokam Culture extended. Collectively, the Core and Peripheries formed what is referred to as the Hohokam Regional System, which occupied the northern or Upper Sonoran Desert in what is now Arizona. The Hohokam also extended into the Mogollon Rim region. In North America, the Hohokam were the only culture to rely on irrigation canals to water their crops since as early as 800, and their irrigation systems supported the largest population in the Southwest by 1300. Archaeologists working at a major archaeological dig in the 1990s in the Tucson Basin, along the Santa Cruz River, identified a culture and people that were ancestors of the Hohokam who might have occupied southern Arizona as early as 2000 BCE. This prehistoric group from the Early Agricultural Period grew corn, lived year-round in sedentary villages, and developed sophisticated irrigation canals. Sears-Kay Ruin Fort Mystery Room before circa 1050 AD: This room had rounded corners. 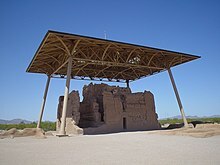 The distinctively modern-looking roof was built in 1932, to protect the Great House or Casa Grande, at the Casa Grande Ruins National Monument. The Mesa Grande Temple Mound is located in the Mesa Grande Cultural Park at 1000 N. Date St. Built by the Hohokam in AD 1100, the walls are made of caliche, the calcium carbonate hardpan that forms under the desert soils. The mound is longer and wider than a modern football field and is 27 feet high. At its peak in the late Preclassic and early Classic periods, this settlement may have consisted of as many as 20 discrete residential areas and covered several hundred acres. Today, due to massive urban development, the surface remains of the village have been reduced to a 6.4 acre parcel situated immediately west of the old Mesa Hospital. Within this plot are the ruins of a large adobe compound and a nine-meters-high, relatively intact, platform mound. This is only one of the last three remaining Hohokam platform mounds in the greater Phoenix metro area. This parcel was transferred into public ownership in the mid-1980s, therefore the compound and mound were not destroyed and a full visitor center exists on the enclosed site that is open October-May annually. Over time, the Los Hornos settlement expanded along a series of large secondary canals to the east and southeast. At the height of the Preclassic occupation in the Sacaton phase, which was contemporary with the zenith of Snaketown, this settlement had one large ball court, a large central plaza, several formal cremation cemeteries, numerous trash mounds, and several hundred residential pithouses. The detailed excavation of 50 Preclassic period pithouses in the area located immediately south of US 60 and east of Priest Dr, provided invaluable information concerning residential architecture and the functional use of interior space. Additional information concerning the Archaeological Consulting Services Ltd. excavation of a Preclassic occupation at Los Hornos can be found at the following site. The following Hohokam archaeological sites and museums are open to the public, except for Hohokam Pima National Monument. Hohokam Pima National Monument (Snaketown), Gila River Indian Reservation (closed to public). Mesa Grande Ruins, Mesa, Arizona. Pueblo Grande Museum Archeological Park, Phoenix, Arizona. 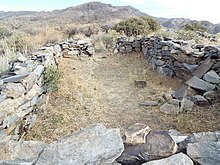 Sears-Kay Ruin – Hohokam Fort on top of a foothill in Carefree, Arizona. Hohokam pottery sherds (The small brown ones) found in the ruins on top of Indian Mesa. Hohokam pottery sherd in the Tucson Basin. Notice the distinctive red paint. Petroglyphs at the Painted Rock Petroglyph Site. A large plaza in front of the Mesa Grande Temple Mound which was enclosed by a large adobe wall. ^ Powell, James Lawrence (2008). Dead pool: Lake Powell, global warming, and the future of water in the West. University of California Press. p. 32. ISBN 978-0-520-25477-0. ^ a b c "The Hohokam". Arizona Museum of Natural History, City of Mesa. Archived from the original on November 30, 2012. Retrieved November 30, 2012. ^ Haury, Emil W Snaketown: 1964–1965, Kiva Vol. 31, No. 1. Maney Publishing on behalf of the Arizona Archaeological and Historical Society, Oct. 1965, p. 8. ^ Powell 2008, pp. 32, 33. 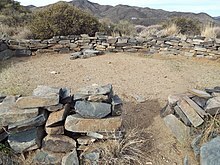 ^ "Virtual Hohokam Chronology Building and Research: Los Hornos". mc.maricopa.edu. Retrieved July 30, 2008. ^ Arizona Museum of Natural History: Mesa Grande Ruins — the ruins are under direction of the museum. ^ Phoenix Parks Dept: Pueblo Grande Museum Archeological Park Archived April 13, 2010, at the Wayback Machine — Pueblo Grande Ruin and Irrigation Sites. Lekson, Stephen H., 2008 A History of the Ancient Southwest. School for Advanced Research Press, Santa Fe. Wikimedia Commons has media related to Hohokam. Tucsoncitizen.com: "Hohokam stargazer may have recorded 1006 supernova"